Music is the ultimate form of art because it can truly help you heal a wounded heart, express your emotions, and allow you to relax after a hard day at work. So what better way to enjoy these benefits if not by looking for some brand new music gadgets or decorating your house walls with some unique pieces of art? Below you’ll find some of the art pieces that inspired us and made us search for some new music to listen to over a large glass of wine while enjoying life. This metallic decoration plate comes in five different and unique designs. You can hang it on the walls of your bar or in the living room. It goes perfect with industrial decors and makes a great addition to any bachelor’s loft or flat. The product measures 12×12 inches and comes with four holes that allow you to mount it anywhere you like without any efforts. 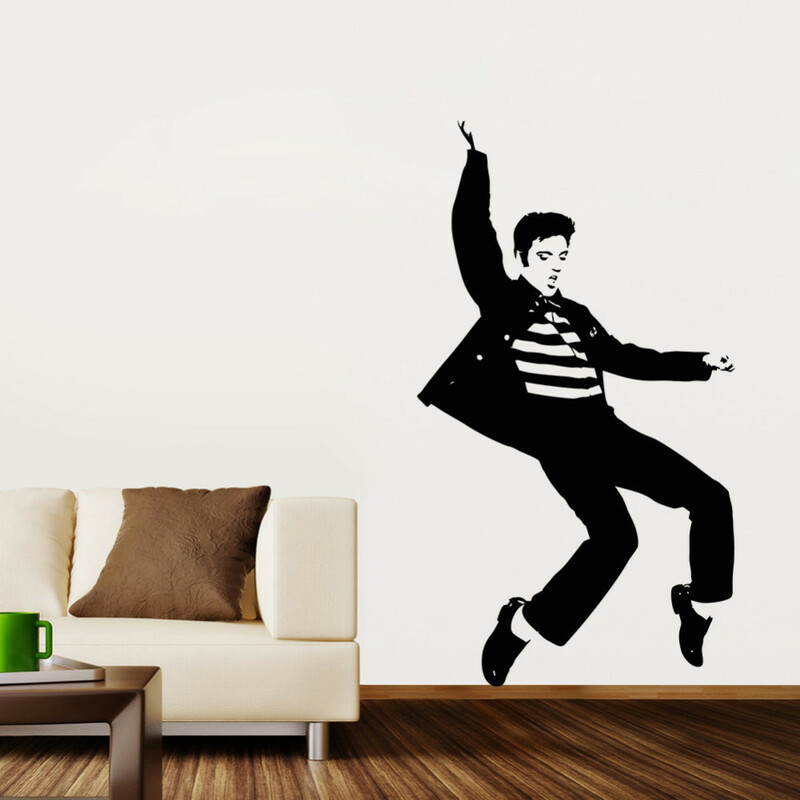 For a full effect, we suggest you add other similar pieces of decoration on the same wall. The decoration plate is made of high-quality metal that won’t rust or change its color in time. This product is also available in various designs, so make sure to choose the one that best matches the rest of your bedroom, living room or bar decor. We suggest you start with the colorful girl graphics that measures approximately 7.8×11.8 inches. It is made of high-quality and eco-friendly materials that will preserve its original color for many years from now on. The metal won’t rust or change its shape either. This vintage piece is the perfect gift idea for friends or relatives who love music and art. It also features four holes to mount it on the wall easily. What better way to find your inspiration while working on your new album if not by getting this cool DIY piece of wall decor? When ordering you’ll receive a random batch of 12-inch records, fully functional and ready to be played. They are perfect for your crafting projects and can also be used as a wall decoration. All you need to do is tie them together using thin rope or glue them on a plate. And, since they are fully functional, you can play them at your themed parties for a touch of vintage and groove. 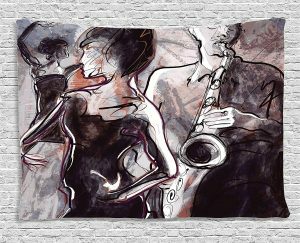 For those of you who are passionate about jazz music or looking to redecorate a jazz pub, this fantastic piece of wall art is the right choice. It is made of satin, a soft-touch fabric and comes with hand-sewn edges for extra elegance. It is machine washable and made of 100% high-quality polyester silky satin. The image features vivid colors and crisp lines to provide perspective. Your bar or bedroom walls will definitely look better with this piece of art decor. Since it’s 60 inches wide and 40 inches long, we don’t suggest you pair it with other wall decorations. 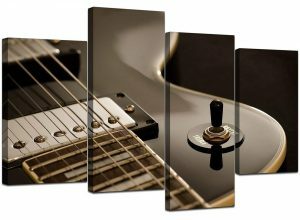 If you’re looking for a cool wall decor for your basement, bar or bedroom, this set of four canvases is the perfect choice for you. They come already framed and ready to be hanged. You can choose to display the four pictures together or separately, depending on your preferences. Together they form the silhouette of an elegant guitar while alone they can be used as abstract paintings. The product will certainly become the centerpiece of your room but for a full wow effect put it on brick walls or simple white walls. It is delivered with wall fillers and a hanging template. Music artwork surrounds us. Whether you go have a cup of coffee in your neighborhood or go to a pub on a Friday night with your friends, you’ve probably come in contact with some kind of music artwork or the other. One of the factors you should focus on when you are in the market for such a product is whether you’d prefer to go for a personalized piece or one that you can find for a low price virtually everywhere. For example, posters with treble clefs, music notes, cassettes, guitars, and all sorts of instruments or items related to music one way or the other are available for meager prices. 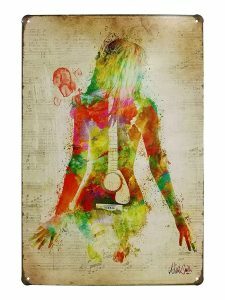 You can find a variety of cool music paintings online or at any shop, but they don’t have to be limited to one specific artist. However, they can be if that’s what you’re searching for. When it comes to the best music paintings, one could be of a Gretsch guitar, and the next could be a colorful representation of David Bowie. So, it is easy to tell that everyone’s different and even musicians have diverse tastes from one person to the next. Because the broad array of cool music posters, paintings, and sketches is truly baffling, we suggest taking a look at the following buyer’s guide. We’ve made sure to include all the right info that you ought to take into account if you plan to get a great gift or buy a breathtaking music album artwork or music-related art piece for yourself. 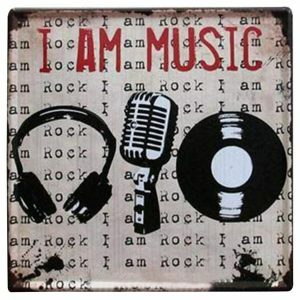 What type of music artwork for sale are you looking for, exactly? 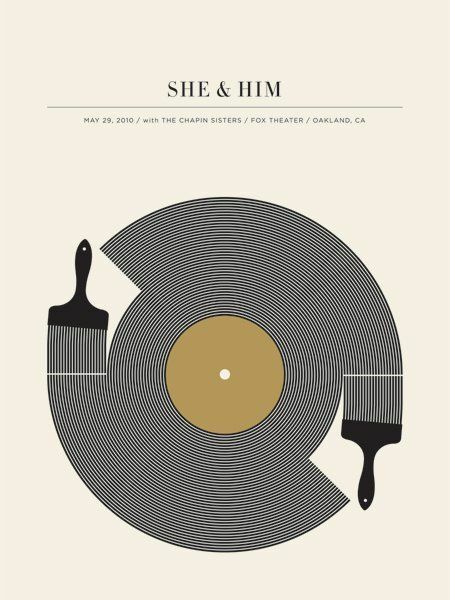 As we have noted above, the best music posters can mean two different things to two people. What this means is that one person can find it amusing to hang a picture of a pianist cat on his or her bedroom wall while someone else might find this tacky. While we do not want to agree with one side or the other, it is without a doubt crucial for you to understand your requirements and tastes in this matter. The type of artwork you might be after also refers to the actual picture. Are you looking for an album cover, do you want to hang a picture of Freddie Mercury in your living room, or you’re good with a poster of some simple musical notes? Think about all of this before deciding to spend your pennies. Who knows when you might have a change of heart and decide that you don’t really like that poster, after all? Not only does the album cover need to reflect your taste in music, but it also has to look cool. That is unless you plan to purchase it and hide it somewhere where you alone can look at it. And let’s face it, the chances of you wanting to do that are pretty slim. 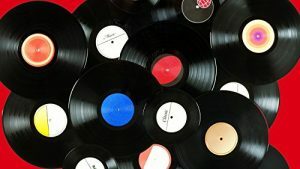 Obviously, you ought to make sure that the album poster you’re going to pick has something to do with the kind of music you regularly listen to. Choosing house music artwork is a bad idea if your favorite bands are Led Zeppelin, Deep Purple, Green Day, AC/DC, and many others who play rock music. Even on this account, people have to agree to disagree. While some might say that the coolest album cover ever to have been designed is Bat Out of Hell by Meat Loaf, others might say that it is by far the most tasteless image ever to have seen the light of day. These individuals would, perhaps, prefer something in the lines of AC/DC’s Back in Black or Is This It by The Strokes. Of course, if your tastes are classic and classy, you should definitely check out Queen II. While a poster of a music album might cost little to nothing, a painting won’t be as affordable. The point that we’re trying to make is that you should try to assess your expectations in this sense and have a budget prepared for the expense, especially if you want to choose the previously mentioned painting. Another idea you could benefit from is getting in touch with an artist and asking him to create a sketch of your favorite singer. The sketch is also available at a price that varies from one artist to the next, but it’s safe to say that some might be more affordable than real paintings. Is it supposed to be funny or not? As we were saying, some people might want to pick a funny-looking picture of a cat playing the piano. The problem with such a choice is that not all folks have the same kinds of humor. While for some, a robot playing the guitar is awesome and fun to look at, for others, it is anything but amusing. If the music artwork you intend to spend your pennies on will be a present, we suggest finding out as much as you can about the person you’re going to give the gift to. If you have no idea what music he or she listens to regularly or their favorite albums, perhaps getting them something else is better. You could always go for the classic scented candle or personalized cup, you know. They say that it’s better to be safe than sorry; let’s face it, if the present is for your boss, this saying is truer than ever. Plus, what’s the message you’re trying to relay with the artwork? If you’re getting an album cover poster for your boss and that album cover is Wish You Were Here by Pink Floyd or Another Brick in The Wall, think twice before doing it. You really can’t know if folks can misinterpret your intentions and understand whatever they want to understand from your gift.